Two official State of Tennessee Historical Markers flank the front entrance to Immaculate Conception Church in Knoxville, TN. The first recalls the Civil War, when Summit Hill was the site of Union fortifications during the 1963 Battle of Knoxville. The other, on the corner of Vine and Walnut, honors Fr. 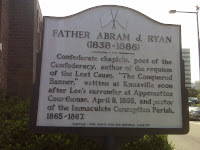 Abram Joseph Ryan (1838-1886), the famous Catholic poet and Confederate patriot, who served as pastor of Immaculate Conception from 1865 to 1867. Across the street, the residential row houses at 415 West Vine are named “Ryan’s Row,” in the former pastor’s honor. Ranked as perhaps only a minor American poet today, Fr. Ryan was widely read and his poetry highly esteemed throughout the South in the post-Civil War period, and his religious poetry was very popular among Catholics. 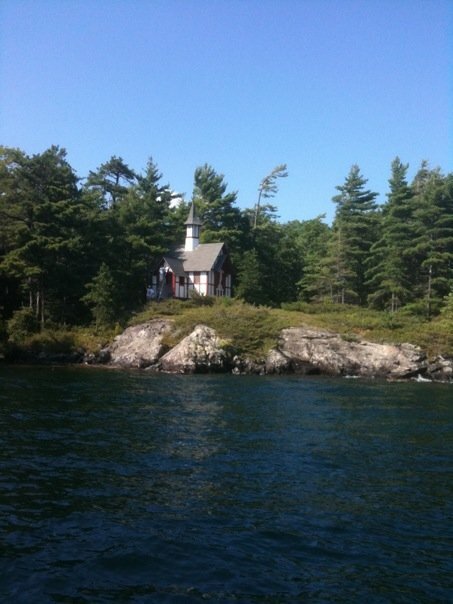 He himself, however, professed a rather modest view of his efforts: “These verses (which some friends call by the higher title of Poems – to which appellation the author objects) were written at random – off and on, here, there, anywhere – just when the mood came, with little of study and less of art, and always in a hurry.” However hurried, his output was impressive. As pastor, I have inherited a nicely leather-bound 1908 collection of my famous predecessor’s complete poems, and I count some 131 poems (a few of them posthumously published), some short, but many quite lengthy. The overwhelming majority of Fr. Ryan’s poems are religious in inspiration. After a period of distinguished service as a chaplain in the Confederate Army, Fr. Ryan came to Immaculate Conception as pastor in 1865, shortly before Lee’s surrender to Grant at Appomattox, the event that inspired what was perhaps his most famous poem, The Conquered Banner. Reprinted repeatedly and memorized by Southern school children, that poem made him a household name in the post-war South. Fr. Ryan gave an original hand-written draft of the poem to the Ricardi family of Immaculate Conception Parish. After remaining in the family for several generations, it is now in the historical collection of the Knoxville Public Library. See How Differently They Do Things! On a Sabbath Jesus went to dine at the home of one of the leading Pharisees, and the people there were observing him carefully [Luke 14:1]. Now what do you suppose they were watching for? Were they like modern journalists, on the lookout for something they could trap him in, what we would nowadays label a “gaffe”? In fact, they were so busy observing Jesus, they probably didn’t notice that he was watching them, that he was noticing how they were choosing the places of honor at the table. They must have been taken aback a bit when Jesus took the opportunity to give them a lesson in manners. Now, believe it or not, I actually know someone who did as Jesus suggested (whether or not that was his actual intention) – and it worked! It was 17 summers ago when I was in abroad. The mayor of a major American city was visiting, and the local mayor was holding a lunch in his honor, to which a certain American priest was invited. As he told the story, he wandered into the banquet room and just sat down at a table where there were several empty seats. No one seemed to notice or pay any particular attention to him, until suddenly someone came up to him and said: “Father, here you are. You’re supposed to be at the head table!” So he followed her up to the head table, all the while noticing how the very same people who had not noticed or paid any attention to him a few minutes before were now suddenly very interested in knowing who he was! Knowing my friend, I suspect his modest behavior that day came quite naturally. That’s just who he is! Others may be more manipulative, exhibiting an externally humble pose, all the while expecting a contrary compliment from others. What we now fashionably call poor self-esteem might motivate some to minimize their accomplishments in the hope of being contradicted by someone who will give them the praise they think they deserve (but are afraid to claim for themselves). Of course, this can be a problem, if your poor self-esteem turns out to be accurate, if your humility is not contradicted, if, when you take the lowest place, no one says, “My friend, move up to a higher position.” Most of us, I suspect, might be rather reluctant to risk confirming that we do in fact belong down there in the lowest place. So frightening is that prospect for most of us that, rather than risk it, we willingly spend much of our lives playing the dangerous game of competing constantly for the next higher position. Jesus, however, was not primarily giving his audience a lesson in manners. The kingdom of God, Jesus never seems to tire of trying to teach us, is about the complete reversal of all our ordinary expectations. So this ordinary lesson in manners served for Jesus as an extraordinary lesson to help us break through all those barriers and preoccupations which stand in our way, inhibiting us from becoming the people God wants us to be. Typically in the gospels, when Jesus is a guest at someone’s home, Jesus the guest tends to take over and act as host. This incident is no exception. So Jesus, having instructed his audience on how to be a good guest, goes on to give advice on how to be a good host – advice which says something to us about what kind of host he himself is, and which tells about God’s behavior toward us and the imitation God is inviting as our response. The gospel began by telling us that the people were observing Jesus carefully. In some ways, the tragedy of so much of our history has been how much and how often we as Jesus’ disciples have failed to observe him carefully - and having observed him to imitate him. False humility make life a little easier and ease the way for certain relationships to be more successful. But the true humility of Jesus’ disciples has a new and priceless dimension of meaning, ever since Jesus himself has revealed the humility of God toward us and has invited us to imitate him in that. Jesus’ advice becomes this challenge for all of us who call ourselves his disciples. Can people look at us and say: “See how differently they do things”? Homily at Immaculate Conception, Knoxville, August 29, 2010. In the Roman Calendar, August 27 and 28 celebrate the most famous and influential mother-son combination (after Mary and Jesus) in the history of Christianity - St. Monica (331-387) and her illustrious son, St. Augustine (354-430), brilliant rhetorician, spiritual seeker, convert, Bishop of Hippo, and Doctor of the Church. Both were natives of Roman North Africa. Monica's husband and Augustine's father, Patricius, was a small landowner and member of the town council, a pagan who became a Christian only late in life. Religiously, it was Monica, a devout, life-long Catholic, totally steeped in popular piety (as opposed to intellectual theologizing), who was the more influential. Everything we know about Monica comes from Augustin's Confessions, which minimizes Patricus' infuence and highlights Monica's. As Paul Tillich pointed out, in his A History of Christian Thought, Monica's influence on Augustine meant the inlfuence of Christian traditon. Tillich compared Augustine with Plato, who had written out of the traditon of the Athenian gentry to which he belonged, but which was coming to an end, whereas with Augustine the tradition was new. What we call Augustine's "conversion" involved a return to the religion of his childhood. Thus, Karl Adam (Saint Augustine: the Odyssey of his Soul) described Augustine's youthful religious conflicts as a fight against the Church already in his heart. Despite her piety, Monica was a typical mother in her ambitions for her brilliant son, which was why no early marriage was arranged for him lest his upward mobility be hindered - something Aguustine regretted and criticized his parents for, believing that marriage might have helped him in his struggle against concupiscence. As a mature Catholic, Augustine appreciated the value of social institutions like marriage, which serve human well-being and direct it toward humanity's ultimate goal. As a bishop, one of his social tasks would be to arrange marriages for those entrusted to him, and he showed his support for marriage as a social institution by refusing legacies which would have benefited the church materially but would have gone against the norms of inheritance. Perhaps even more important than not arranging a marriage for him was his parents' failure to have him baptized, because of the curious custom in North Africa at that time of delaying baptism. This would be an important lesson Augustine would take to heart later in life when he had to combat other rigoristic tendencies in the Church and strenuously advocated infant baptism. The result was that, although a catechumen, Augustine was a anything but a committed Catholic Christian, when he left home at 16 to begin his brilliant career, during which he sampled the leading intellectual and religious ideas of his time, resisting in his intellectual sophistication the idea that the truth might lie in the religion of his mother. Yet his mother remained a presence, eventually even following him to the Imperial Capital, Milan, where both came under the influence of the aristocratic bishop of Milan, St. Ambrose. It was Ambrose who finally bapitzed Augustine at East 387, bringing Auugustine's "spiritual search" to its proper end. The transition from Augstine as seeker to Augustine as man of the Church also marked the end of Monica's presence in his life. Her role having been completed, as she herself asknowedged, she died at Ostia some months after Augustine's baptism. In one of their last conversations, Monica said to her son, "I did have one reason for wanting to live a little longer: to see you become a Catholic Christian before I died. God has lavished his gifts on me in that respect, for I know that you have even renounced earthly happiness to become his servant" (Confessions, 9:10). St. Monica is remembered in the Church as a model of virtuous motherhood and persevering prayer. Her son went on to become the leading figure in Latin Christianity's theological tradition, and is recalled today as Doctor gratiae, the "Doctor of grace." In the Latin Church, today is observed as the feast of the apostle Bartholomew, traditionally identified with the Nathaniel mentioned in John’s Gospel. (The Eastern Churches generally celebrate St. Bartholomew on June 11; the Copts on January 1). He is traditionally supposed to have preached the Gospel in Ethiopia and possibly India and to have been martyred in Armenia. According to legend, he was flayed alive, hence his portrayal in Michelangelo's Last Judgment holding his own skin in his hand. As if that weren’t gruesome enough, a number of famous historical calamities have occurred on this day. In A.D. 79, Mount Vesuvius erupted and destroyed the cities of Pompeii and Herculaneum. In 410, Alaric and his Goths sacked the city of Rome. In 1572, there occurred the infamous St. Bartholomew’s Day massacre, in which some 70,000 Huguenots are supposed to have been slain. In 1814, the British burned the White House and the Capitol in Washington, DC, presumably in retaliation for the American attack on the Parliament of Upper Canada (Ontario) in York (Toronto). And in 1992, Hurricane Andrew did record damage in Florida. It has not been a completely calamitous day, however. On this day in 1981, I (and seven others) entered the Paulist Novitiate at Mount Paul, Oak Ridge, NJ, (see photo above), and thus embarked upon an unparalleled experience of personal and spiritual growth, thanks to which I am here today as a Paulist, a priest, and a pastor. So, thank you, Saint Bartholomew! For the past several Sundays (prior to the Assumption), the Sunday gospels have highlighted Jesus’ instructions on the type of life his disciples should lead and the serious choices they may be required to make. So we should hardly be surprised that somebody finally asked him, “Lord, will only a few people be saved?” This was not some abstract academic discussion on a theoretical level about the total number of those who will make it into the kingdom. This was a practical, personal question about what is ultimately the most important thing of all – salvation. Having listened carefully to Jesus’ instructions and having felt the weight of his demands, we can easily empathize with the questioner and understand his concern. Jesus was an expert at not answering a question directly and instead shifting the focus to the person asking the question. So, instead of entering into a debate about numbers and the salvation of others, Jesus focused on the questioner himself. He told him what to do: “Strive to enter through the narrow gate.” Strive, Jesus says, using a word that suggests intense energy, the intense energy of an athletic contest, for example. Even more to the point, do it now. The time to enter that narrow gate, the time to get with the program (as one might say it today) is now. We have only a limited amount of time in life. When it is over, we may well wish we had used out time better, used it to focus our priorities on the things that matter most. We may wish we had entered when we had the time, when the door was till open; but by then the door will have been locked, and it will be too late to change our minds. The key point in all this, of course, is that, however narrow the gate may be, as of now it is still open – open for us, open in fact for all sorts of people to squeeze through, from the east and the west and from the north and the south, says Jesus, echoing the astounding image in today’s 1st reading [Isaiah 66:18-21] in which the Lord says he will come to gather nations of every language. Just imagine all those Gentiles being brought to Jerusalem! Imagine Gentiles being transformed by God himself into priest and Levites! Isaiah’s prophecy invites us to hear today’s Gospel in its fullness. The fact that the gate is narrow is a challenge, to be sure, but not a menace. We can, of course, come to feel menaced and so give in to discouragement. Of course, if I think it’s all about me, then the gate is certainly going to appear much too narrow - much too narrow for the likes of me to squeeze through on my own. But, of course, it’s not all about me – or about anyone of us! It’s about God’s great plan for the salvation of the world. It’s about what God is doing – and is going to do. And it’s about my – and your, and his, and her, and our – wanting to be part of it, wanting to focus our lives on what matters most, here and now, day by day. The opposite of despair, of course, is presumption, the perncious idea that one can just demand entry as if by right, no effort required, no response in return to God whose love alone opens the gate for us. We will avoid both despair and presumption when we appreciate that the effort involved, all our striving for salvation with the intense energy of an athletic competition, is, in this case, a team sport. Note that in Isaiah’s prophecy, people don’t just show up from all the nations. They are brought in by others sent out to get them, missionaries proclaiming God’s glory among the nations. We walk through the narrow gate together. And, as long as we are willing to help one another - and are willing to be helped in turn – that gate will prove wide enough. Undset's trilogy's 1st volume, The Wife, ended with Kristin's wedding to Erlend, that presumptively joyful event clouded over by Kristin's secret knowledge of her pregnancy and by her father's realization that she and Erlend had already consummated their marriage in advance. The second volume, The Wife, picks up in the aftermath of all that and traces the subsequent years of Kristin's married life, during which she gives birth to seven sons, serves (somewhat) as stepmother to Erlend's earlier children, becomes increasingly religious, and successfully manages Erlend's principal estate, Husaby. Once again, Undset creatively combines her fictional plot with actual 14th-century Norwegian history enacted against the background of a vividly described landscape, and with an intense feel for the dynamic spirtual experiences of medieval churchmen and laypeople. Much more extensively thant The Wreath, The Wife is dominated by the complexities of 14th-century Norway's political situation, both internally and externally in relation to Norway's neighbors - the Swedes, with whom Norway then shared the same Crown, and the Danes, Finns, and Russians, with whom Norway was sporadically in conflict. All these difficulties were exacerbated by the Achilles Heel of any monarchy - the king's minority. While King Magnus is a minor, Norway must be governed by a regency, with all the infighting and factional conflict that such a situation entails. In Undset's fictional plot, Erlend (of royal blood himself) gets deeply involved in national politics, both for good and for ill. For good, he assumes positions of military and civic responsibility which improve his image and compensate somewhat for his tarnished reputation. For ill, however, Erlend in the last part of the book recklessly gets involved in a plot to undemrine the young king. Caught (thanks largely to his own irresponsbile involvement with a woman, itself brought on by tensions between him and his wife), Erlend is tried, convicted, and sentenced to death. Thanks primarily to the intervention of Simon Darre, Kristin's former betrothed (and now husband of her much younger sister), Erlend's life is finally spared. All the political intrigue provides an interesting background for the personal and spiritual struggles of the story's principal characters. Throughout, the book is dominated by Kristin's intense remore for her sinful involvement with Erlend prior to their marriage, for conceiving his child prior to their wedding, and for having deceived her father. Kristin and Erlend maintain regular marital relations and have seven sons, and they maintain relatively positive familial relations with Kristin's parents until Lavrans' death and with Kristin's former betrothed after he becomes their brother-in-law. Yet all these relationships are overshadowed - and diminished - by Kristin's morbidly omnipresent sense of guilt. As soon as possible after the birth of her illegitimately conceived first son, Kristin undertakes a penitential pilgrimage to St. Olva's shrine where she donates her wedding wreath (which she had illicitly worn). Nothing, however, can completely undo the damage done to the principal relationships in her life - with her husband, her father, and her eventual brother-in-law. The dark cloud that hangs over Kristin's marriage and family life provides a conspicuous constrast with her willful behavior in The Wreath. If the first book seemed at times almost to celebrate Kristin's rebelliousness, this second volume starkly highlights the harmful consequences that follow from violating social norms and moral rules. As the priest Gunnulf explains to his brother Erlend: "you drove her into sinful defiance against everyone God had put in charge of this child ... Surely you must realize that, Erlend. You have sown a thicket of brambles around yourself, with nettles and thorns. How could you draw a young maiden to you without her being cut and flayed bloody?" On that note, I am looking forward to reading volume 3. Amazingly, 18% of Americans apparently believe that President Obama is a Muslim. So reports the Pew Research Center's poll done in late July-early August. That's up from 11% in March 2009 - and before the current controversy erupted about the Mosque near Ground Zero. According to an even more recent Time magazine poll, 24% believe the President is a Muslim, 47% believe he is a Christian, and 24% say they don't know! Now one of the features of contemporary life is an ideological disdain for facts. Perhaps the most blatant example of this is the absurd belief, which some people insist on maintaining without any evidence, that the President is not a natural-born American citizen. In the current climate, people on either extreme of the political-cultural divide increasingly get their information exclusively from fellow true-believers and accept as facts only whatever confirms their pre-existing ideological stance - however counter-factual such supposed "facts" may be. (This is not a totally new phenomenon. Remember all those lefties who refused to believe that Oswald alone killed JFK. But a way of thinking that used to be recognized as extreme and marginal has become much more common and mainstream). So maybe one shouldn't be so surprised that opponents of the President choose to believe that he is a Muslim. Much more significant, however, is the surprising fact that almost a quarter of the population may say that they do not know what the President's religion is! To the perpetual dismay of our secularist elite, the United Sates remains the Western world's most religious country. Americans seem to prefer that their presidents practice some religion. Like their fellow citizens, our presidents have been all over the map of religious belief and observance - from fervent Evangelical (Jimmy Carter, George W. Bush) to virtual Deist (Thomas Jefferson). With one Roman Catholic exception, however, all our presidents have been at least nominally Protestant, and most of them seem to have acted more or less according to expectations. Although only baptized after his election, President Dwight D. Eisenhower attended church regularly and even invited Soviet ruler Nikita Kruschev to accompany him to church during the latter's 1959 state visit. (He didn't.) Among recent presidents prior to Obama, Ronald Reagan was conspicuous for not being a regular churchgoer. He got away with it, I suspect, because his claim to be a Christian was nonetheless seen as sincere (and perhaps not unlike that of many other non-churchgoing Americans), and also because Reagan so successfully identified himself with core American values. Despite his upbringing, President Obama definitely has identified as a Christian. In Chicago, he attended church and was affiliated with the United Church of Christ denomination. Since becoming president, however, he has not affiliated with any church. Nor does he employ Christian religious rhetoric as frequently and fervently as many of his predecessors (including Reagan). The latter may be even more relevant than the lack of church attendance. Under different circumstances, that might not matter for there to be a widespread popular perception of Obama as a Christian. In the present situation, however, it apparently does. Practically everybody, so it seems, has an opinion about the proposed mosque to be located in New York near the site of the 9/11 attack by Muslim terrorists in 2001. Even the President has weighed in on the issue (and has been duly criticized by both sides). Sometimes being criticized by both sides suggests that one has embraced some rational middle ground, offensive to extremists at both ends of the spectrum. On the other hand, being criticized by both sides can also be a consequence of an unimpressive attempt to have it both ways, which seems more likely the case in this instance. Yet, while the President’s defense of our American tradition of religious freedom followed soon after by an awkward attempt to distance himself from any endorsement of this particular mosque in that particular place seemed like just some politician’s attempt to have it both ways, it could conceivably have been presented instead as a principled argument trying to take into account the competing values involved in this controversy and allowing a greater role for common sense than ideologues on either side generally admit. It is, of course, true that freedom of religion is a core American value, and that certainly includes the right of any religious group to worship publicly in buildings they have built or bought, on property they have purchased or otherwise legitimately acquired. It even includes the right to conduct acts of public worship (e.g., processions) in public streets, subject always to ordinary regulations in the interest of public order. No one seriously disputes any of this. Churches, synagogues, and more recently mosques have been built and religious services conducted throughout this land subject to those general restrictions and limitations that are reasonably and generally accepted as rightfully imposed by governments to promote public safety and health and maintain public order. So, quite apart from whether or not one likes mosques or thinks they are good things, one can certainly accept that our system entitles Muslims to erect a mosque in Manhattan, while at the same time recognizing the possibility that there may be legitimate arguments against its erection in a particular place. Reasonable people can and will disagree about whether those objections represent legitimate public concerns or irrational prejudice. When the original Immaculate Conception Church was built in Knoxville, TN, in the mid-1850s – on a prominent hilltop overlooking what were then the northern limits of the city – some local people did object. The March 10, 1855 Knoxville Whig warned that Catholics “are a dangerous population much to be dreaded.” The Knoxville Protestant community, however, did not universally share this view. The Mayor, a Presbyterian, even donated an adjacent plot of land to the new parish. Had there been a more rational basis to the allegation that Catholics posed a danger and should be dreaded, perhaps the outcome might have been different. Thomas Jefferson famously saw Roman Catholicism as inimical to American liberty. History has contradicted Jefferson, and his views now appear as typical Enlightenment prejudice. If Jefferson were around today, with his same Enlightenment views, he probably would have similar reservations about Islam. As with Catholicism, the question of whether or not a particular religious belief or practice is compatible with American values is in part a question of fact and in part a matter of judgment. Historian Arthur M. Schlesinger, Sr., famously characterized anti-Catholicism as "the deepest bias in the history of the American people." In 1960, Peter Viereck said that "Catholic baiting is the anti-Semitism of the liberals." Yet the reality is that Catholicism never really posed a significant threat to American democracy. All the allegations to the contrary ultimately could not compete with the plain fact, evident to unbiased observers, that Roman Catholics embraced the American way of life as eagerly as other immigrants. Whatever their theoretical beliefs, American Catholic practice was tame enough to fit into American culture. Mormonism, though native to the United States, had a harder time because of its very counter-cultural practice of polygamy. In 1862, Congress outlawed polygamy in all US territories. The unanimous 1878 Supreme Court decision Reynolds v. United States declared that polygamy was not protected by the Constitution, based on the longstanding legal principle that "laws are made for the government of actions, and while they cannot interfere with mere religious belief and opinions, they may with practices." The official Mormon Church eventually abandoned and proscribed polygamy, rendering mainstream Mormon religious practice likewise tame enough to fit into American culture. Since its creation in the 7th century, Islam has often been at war with the Christian societies of the West - probably for more years than it has been at peace. As Diarmaid MacCulloch has recalled, for example, in his magisterial history of the Reformation, historians estimate that Islamic raiders enslaved some one million Western European Christians between 1530 and 1640. The decline of Ottoman power after the decisive 1683 battle of Vienna ushered in a period in which Islam no longer posed a significant threat to Western ways of life. To what extent the events of the 20th and 21st centuries have decisively changed that involves an assessment of fact and an interpretive judgment, about both of which there can be – and obviously is – considerable disagreement in the post-9/11 world. It should not be necessary, however, to resolve all such disagreement in order to appreciate the strong feelings raised by the possible location of this particular mosque in that particular place. In some respects, the controversy reminds me of the 1980s controversy about the Carmelite Convent at Auschwitz in Poland. Like the proposed mosque, the convent was established as a peaceful place of prayer. Some Jewish groups objected to the visible presence of Christian religious life and worship so close to a site associated pre-eminently with the Holocaust. Of course, a great many non-Jews were also murdered at Auschwitz, many of them Polish Catholics (just as Muslims were victims of the 9/11 terrorist attack in New York). 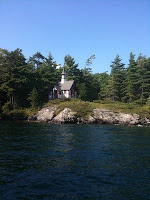 Eventually, however, the Church gave in to the pressure to have the convent moved. The larger questions the controversy raised about the tragic events of the 1940s were left unresolved, but the sensitivities of those most directly offended by the convent were nonetheless accommodated. Regardless of where one comes down on the larger geopolitical questions and value judgments, it seems eminently reasonable to expect a comparably similar sensitivity to addressing this controversy in post 9/11 New York. The sky threatened, and a few drops actually did fall, but that didn’t deter the celebration or dampen anyone’s spirits at Immaculate Conception Church’s 3rd annual “Irish Fest” fundraiser. Nor did the unremitting heat and humidity that has blanketed Knoxville (and so much of the eastern United States) since my arrival diminish the festivity of the occasion. During the Irish Fest, I joined a “Tour of the Church,” conducted by one of our parishioners, and even got to participate in a spirited discussion about the beautiful windows and the as yet mysterious identity of the “unknown bishop” in one of the church’s windows. In my previous posting, it was usually my job to conduct such tours, and so it was a doubly new and exciting experience for me to be on the receiving end of such a tour. As I have been learning more about my new parish in my few weeks here, I have learned that our “Church on Summit Hill” has had quite a quite a distinguished history. The original 1855 parish church had been erected on Summit Hill, its entrance fronting what is now Walnut Street (then known as Crooked Street). Summit Hill was soon to be the site of military action in the Civil War. In September 1863, The Union Army marched into Knoxville and occupied the city. There was a Union artillery position right near the site of the church. During the unsuccessful Confederate attempt to retake Knoxville in November 1863, a house close to the church was hit by a shell and burned to the ground, but the church itself made it through the war undamaged. Ground was eventually broken for the current church in 1883, and the new church was ready to be officially dedicated by the Bishop of Nashville on September 19, 1886. So the present parish church has been in continuous use – including the original pews - for almost 124 years! As I look ahead to our church’s 125th anniversary in 2011, I find myself increasingly fascinated by accounts of the generations of parishioners who have worshipped here and by the treasure of history and beauty they have left for today’s downtown Knoxville. Most of us, I suppose, have heard of Apollo, the ancient Greek god of sunlight, music, and poetry. According to one legend, when Apollo's mother was pregnant, Python the dragon (foreseeing that this new god might destroy his power) pursued her, hoping to kill Apollo at his birth. But Apollo's father just happened to be Zeus, who intervened to rescue both mother and child. And Apollo, in due course, did indeed destroy the dragon. Christianity originated in a world where such stories were well known and an important part of the common cultural heritage. The Emperor Nero, for example, even saw himself as a new Apollo. As for the early Christians, who were themselves objects of Nero's persecution, they also adapted such stories to their own situation. To an ancient Christian audience, already well acquainted with the Jewish Bible, the identity of the woman in today's first reading [Revelation 11:19a; 12:1-6a, 10] would be obvious. She is Israel, God's Chosen People, finally bringing to birth the Messiah, thanks to whom Israel has been expanded now to include all nations and peoples in a new and enlarged People of God, the Church. Christian traditon, accordingly, identifies this woman with the Church, which continues the task of bringing Christ into the world. Now that the Risen Christ has ascended to his throne in heaven, the Church remains behind, still under attack from the forces of evil in the world (as the persecuted first-century Christians would have been well aware), but ultimately full of hope. It is easy to see how they could have come to recongize the story of the Church in the image of this woman - and equally easy to see how the Church in turn has seen the image of this woman as a symbol of Mary, the mother of Jesus, the one who first gave birth to the Messiah and who herself has in turn traditonally been seen as an image, a symbol, of the Church. In Mary's own prayer, her hymn of praise known as the Magnificat [Luke 1:46-55], Mary united herself with the whole story of God's activity on our behalf and so serves as a model for us in identifying ourselves totally with God's plan for the world. An important part of that plan is our hope to share fully in Christ's risen life. Christ, Sant Paul powerfully asserts in today's second reading [1 Corinthians 15:20-27], has been raised from the dead, the firstfruits of those who have fallen asleep. In Old Testament times, the springtime offering of the firstfruits signified the dedication of the entire harvest to God. So the resurrection of Christ (which took place on the day of the offering of the firstfruits) points ahead to the final resurrection of all those who belong to Christ. In Mary's assumption, we have been given a vision of what God, having already accomplished in Christ, plans yet to accomplish in us. Assumed into heaven, Mary links the Church, as we are now, with the Church, as we hope to be then, when Christ has destroyed every sovereignty and every other authority and power. And the last enemy to be destroyed in death. Conscious as we all are of our own death to come, death often seems like the ultimate atttack on all our hopes. Our world is full of natural disasters, inexplicable personal tragedies, and deliberate destruction. Violence and sickness seem to surround us. So powerful does the dragon of death appear, that it dared to attack even Jesus. Only after death had done its worst did God decisively step in, conquering death by raising Jesus from the dead. In Christ, God has given us an alternative future. And, in Mary, Christ's resurrection has, so to speak, become contagious. In Mary's assumption, God has shown himself as her life and her hope - and so also our life and our hope. O higher than the cherubim, More glorious than the seraphim, Lead their praises, Alleluia. Thou bearer of the eternal Word Most gracious magnify the Lord, Alleluia, Alleluia, Alleluia, Alleluia. 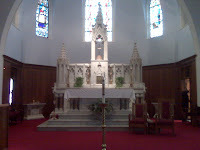 Homily at Immaculate Conception Church, Knoxville, TN, August 15, 2010. La Madonna di Mezz' Agosto was how my late Grandmother used to refer to the Assumption. "Our Lady of Mid-August" may lack the theological precision of the feast's full and proper title, the Assumption of the Blessed Virgin Mary into Heaven. Yet, given that the Assumption falls at the height of the summer vacation travel season, it sort of situates the feast psychologically! I recall how in the summer of 1970, when as an undergraduate I was studying German for the summer in Salzburg, Austria, stores closed and secular activity stopped on August 15 to observe Marienhimmelfahrt ("Mary's Flight to Heaven"). Certainly this season so preoccupied with short-term flight from daily work and cares can be a good moment to pause and consider our long-term flight from the same to the eternal joy of the resurrected life! In the Sacramentarium Gregorianum, which Pope Adrian I sent to Emperor Charlemagne, are found these wonderful words: "Venerable to us, O Lord, is the festivity of this day on which the holy Mother of God suffered temporal death, but still could not be kept down by the bonds of death, [she] who has begotten your Son our Lord incarnate from herself." Just two weeks after his reception into the Church in August 1844, Servant of God Isaac Hecker wrote this in his Diary: "To day is the holyday of the Assumption of the dear blessed Mary mother of our Lord and Saviour Jesus. Oh may I be found worthy of her regard and love." 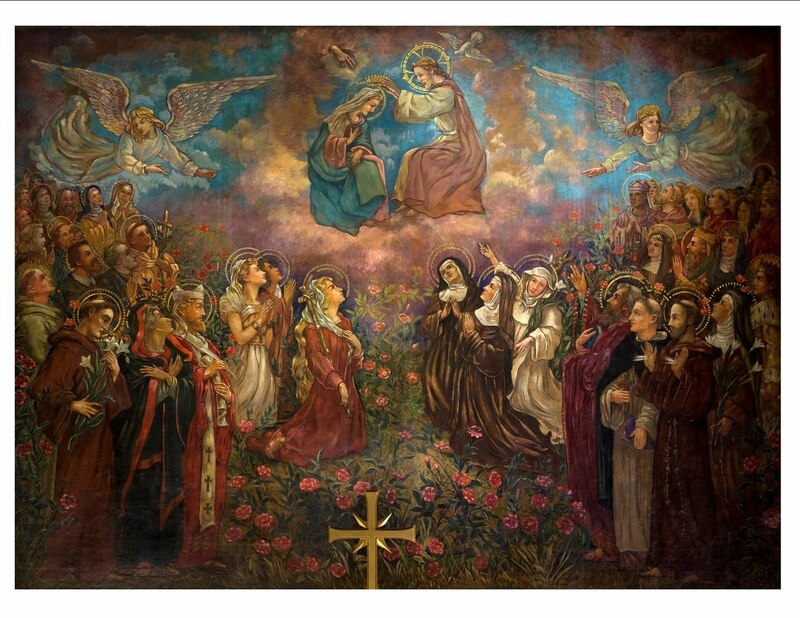 The Assumption of the Blessed Virgin Mary is generally believed to be the oldest liturgical festival in honor of Mary. It certainly ranks as one of the greatest - along with the celebration of her Motherhood on January 1 (the oldest Roman feast of Mary) and her Immaculate Conception on December 8 (the patronal feast of our country and of my new parish). The Assumption celebrates the traditional belief of the Church, as solemnly defined by Pope Pius XII: "that the Immacualate Mother of God, the ever Virgin Mary, having completed the course of her earthly life, was assumed body and soul into heavenly glory." Pius XII's Apostolic Constitution Munificentissimus Deus, which defined the dogma, represents a summary of patristic and scholastic teaching related to Mary's assumption and illustrates how liturgy and preaching have traditionally accomodated scriptural references to iluminate doctrine. Thus, for example, the Pope cited St. Anthony of Padua's use of the psalm verse. Arise, O Lord, into your resting place: you and the ark which you have sanctified [Psalm 132:8]. As tonight's Assumption Vigil Mass reminds us, in the Old Testament [see 1 Chronicles 15:3-16:2], the Ark of the Covenant was where God dwelt directly with his people. Both Mary and the Church are arks of God's new covenant. Mary, the first ark, is already with God and can be seen there with the eyes of faith by the second ark, the Church, which fervently hopes to follow her even as it strives to imitate her here and now. Tonight's Gospel [Luke 11:27-28] meanwhile reminds us that, even more than being Jesus' physical mother (great honor though that certainly was), Mary was first and foremost her Son's disciple, who (from her initial encounter with the angel at the annunciation) heard the word of God and observed it. In her life, Mary totally united herself with the whole history of God's activity on our behalf and so serves as a model for us in identifying ourselves totally with God's plan for the world. An essential part of that plan is our hope to share in Christ's risen life. Through our Lord Jesus Christ, Saint Paul powerfully asserts in tonight's second reading [1 Corinthians 15:54-57], God gives us the victory over sin and death. The resurrection of Christ points ahead to the final resurrection of all those who belong to Christ. In Mary's assumption, we have been given a vision of what God, having already accomplished in Christ, plans yet to accomplish in us. Thus, when defining this dogma in 1950, Pius XII expressed his "hope that those who meditate upon the glorious example Mary offers us may be more and more convinced of the value of a human life entirely devoted to carrying out the heavenly Father's will and to bringing good to others. Thus ... in this magnificent way all may see clearly to what a lofty goal our bodies and souls are destined. Finally it is our hope that belief in Mary's bodily Assumption into heaven will make our belief in our own resurrection stronger and render it more effective." Where Mary is now, there someday we all hope to be! An Episcopalian friend of mine once told me that having a set Lectionary (instead of being free to choose the readings yourself ) is a great blessing, because it forces you to let God's word set the theme, instead of artificially setting it yourself. I do agree with his general point; but I must admit that, had I been free to choose a scripture reading for my first Sunday as your new pastor, I doubt I could have chosen any better than today's 2nd reading (Hebrews 11:1-2, 8-19), interpreting the ancient story of Abraham, whom the liturgy so fittingly calls "our father in faith." According the actual account in Genesis 12, Abraham - at the astonishingly young age of 75 - was commanded by God to move from his ancestral home to some vague new land that God promised to show him. His journey took Abraham from his family home in Haran (in modern Turkey) to the land of Canaan, stopping at Schechem, then journeying east past Bethel, then south through the Negev desert, even sojourning briefly in Egypt. Now, admittedly, my move a couple of weeks ago was nowhere near so dramatic. I just got on a plane at Newark Airport, and two hours later landed in Knoxville. I did, however, have 41 boxes of books and other possessions which were shipped ahead of me and arrived after me. That may or may not seem like a lot, depending on your standard of comparison. I know lots of folks who've moved with many more things. And Abraham, so Genesis says, took his wife, his brother's son Lot, all the possessions that they had accumulated, and the persons they had acquired in Haran. The author of the Letter to the Hebrews appropriately wants to emphasize Abraham's faith. So he does not refer at all to all the people and possessions that Abraham brought along with him. Abraham's faith really was the most important thing he brought with him, but all those other people and things must have mattered to him too. Jesus famously encouraged his disicples to travel light (see, for example, Luke 19:1-9). Detachment from people and possessions is important - at times even necessary. Still, as Aristotle said, a life without friendships would be hard to bear; and, as we all appreciate, the attractiveness of things is plenty powerful too. Nor is that altogether bad. After all, without books, for example, I would not be the person that I am. I really just cannot imagine myself living without constantly reading and learning. As for all those other modern gadgets that have beocme so important of our wired - and wireless - world, we would all probably be better off without some of that stuff. Certainly, multi-tasking is a highly over-rated alternative to actually paying attention to something - or someone. Still, without at least some of those things, modern life would undoubtedly be poorer relationally, because it is increasingly those things that enable us to remain connected with one another. And that is no small matter! In his own unique time and place, Abraham also understood that living productively in this world and maintaining fulfilling human relationshps will almost always require at least some things. Even so, much more important than any possession was the confident faith that freed Abraham to move trustingly in response to God's command, and to make the ultimately best use of all his possessions in the new land God was bringing him to. So it must be for me, as I move from one place to another, from one parish community to another. So it must ultimately be for all of us as we are being challenged all the time, day by day and year by year, to respond to the new opportunities God keeps giving us to follow him and so become the people we are meant to be - the people we together hope to become forever in his kingdom. 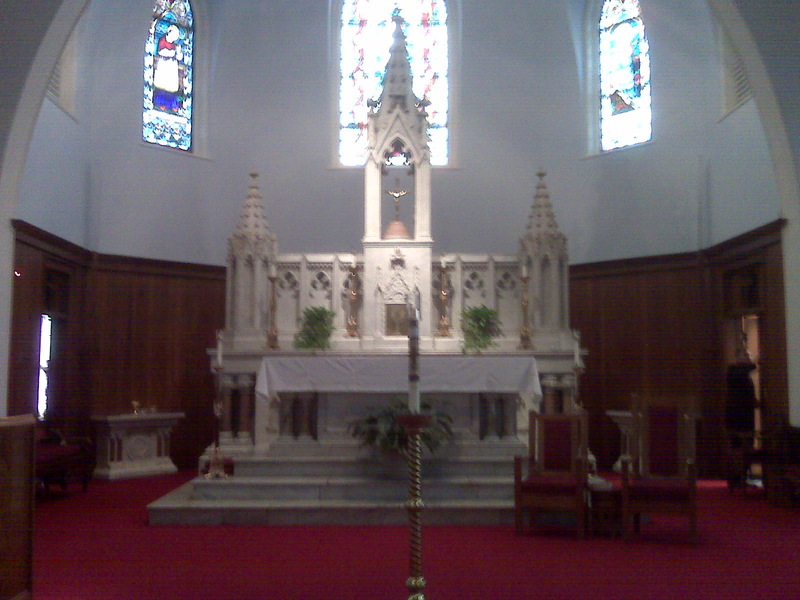 Homily at Immaculate Conception Church, Knoxville, TN, August 7-8, 2010. When I was first taught the Constitution in elementary school, we learned to remember the 3 "Reconstruction Amendments" this way: the 13th Amendment freed the slaves; the 14th made them citizens; and the 15th guaranteed their right to vote. At an age-appropriate level of simplification, that both enabled us to remember them and satisfactorily focused on the original intent of those amendments, which were also the first constitutional amendments to include the since then standard clause empowering Congress to enforce the amendment by appropriate legislation. Since its ratification in 1868, the 14th Amendment has been used by our imperial judiciary to do all sorts of mischief not necessarily intended by its authors. Thus, corporations have been deemed as "persons" entitled to the rights thereof. And much (but, however illogically, not all) of the Bill of Rights has been "selectively incorporated" to bind states as well. Thus, despite the obvious fact that the 1st Amendment was intended to prevent the federal government from establishing a national religion, leaving the states free to maintain established churches if they wished to do so, the 14th Amendment has been used to distort the 1st Amendment into a force for imposing a radical secularist ideology not just on the federal government but also on the states. Be that as it may, it remains clear that, whatever else it may mean or be made to mean, the 14th Amendment is about guaranteeing citizenship and its rights and benefits. In order to guarantee those rights and benefits to ex-slaves in the former Confederate States, the Amendment undid the infamous Dred Scott Decision - Dred Scot v. Sanford (1857), in some respects, the Roe v. Wade of the 19th century - and attached citizenship automatically to fact of being born in the United States. To the best of my knowledge, that has been one of the fundamental, taken-for-granted, givens of American society ever since. Now, all of sudden, in the new nativist, anti-immigrant climate that certain extremist elements have been creating in this country, even the 14th Amendment to the Constitution of the United States is coming under attack. Amending the Constitution is a very difficult task - as it was meant to be and as it should be. That is why there have been so relatively few amendments in the last 221 years. To repeal the 14th Amendment or any part of it would require a considerable consensus in society - certainly not likely in this instance. That being the case, one wonders why this has even been brought up at all. It has been obvious for some time that the demographic evolution of American society and the electorate will sooner or later likely marginalize an anti-immigrant political party or any political party foolish enough to put all its electoral eggs in the nativist basket. Is this latest initiative perhaps a recognition of this fact and a last-ditch, albeit quixotic, effort to reverse the inevitable evolution of the electorate? Quixotic it may be, but it is no less toxic to our political culture and to the fundamental values of American history and society. Whatever else America has been about, it has always been about being (as President Ronald Reagan rightly reminded us) a "city on a hill," whose light beckons to people from all over the world. "Faithful to the Charism of Father Hecker"
Twenty-eight years ago tomorrow, on August 7, 1982, my seven classmates and I completed our year's novitiate and solemnly committed ourselves for one year to membership and mission in the Paulist Fathers, promising to live an evangelical life in accordance with the constitution and in fraternal support of our fellow Paulists. (Three and a half years later, on January 25, 1986, four of us renewed that promise for life). Twenty-eight years later, I am still here - still a Paulist, eventually a priest, and now a pastor. When I consider all that has happened in the interim, I wonder whether it might have been appropriate for someone to have recited to us the familiar (to my generation) words from the old wedding ritual: That future, with its hopes and disappointments, its successes and its failures, its pleasures and its pains, its joys and its sorrows, is hiden from your eyes. No less than a marriage, joining a religious community and committing oneself to its life and mission, may be like a leap into the dark -however joyfully the decision is made and however confidently one makes it. In an age in which lifelong commitments (formerly the social norm) appear increasingly to be exceptions, the leap may seem even more precarious. 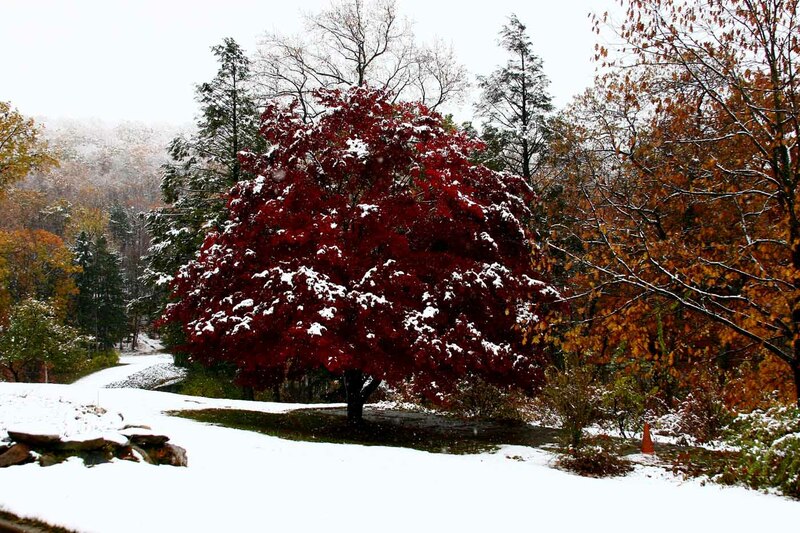 Like so many before and since, Isaac Hecker had his difficulties in religious life. His commitment to it, however, no less than his commitment to the Church itself, never waivered. Having been received into the Church in August 1844, Hecker's immediate task was to discern the appropriate vocation for himself within the Church. Already in 1943, he had apparently embraced a celibate life. In 1845, at New York's Redemptorist Church of the Most Holy Redeemer, he met two other new Catholics, former Episcopalians James McMaster and Clarence Walworth, who were planning to go to Europe to join the Redemptist Order. (Walworth's troubled family is the subject of a new book by Geoffrey O'Brien, recently reviewed in The New York Times and The New York Review of Books). 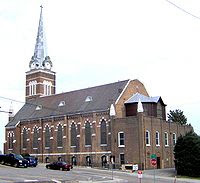 Having decided to join them, Hecker took an overnight train to Baltimore, where he confronted the Redemptorist Father Provincial after his morning Mass and requested admission. As the story goes, the Provincial gave him an on-the-spot Latin quiz, which Hecker passed, and immediately accepted him for the novitiate. 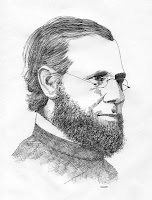 Hecker headed back by train to New York, packed his bag, and was on the ship that night, bound eventually for the Redemptorist novitiate in Belgium. Filled with joy and confidence in his decision and the new life he had embraced, Hecker could hardly have foreseen the difficulties that lay ahead in his formation - and after. And how blessed I have been (and the Church has been) by Hecker's lifelong perseverance! One week ago, attentive to the Holy Spirit and faithful to the example of Saint Paul and the charism of Father Hecker, our one Paulist novice made his profession of First Temporary Promises. Later this month, five earnest new candidates will follow in his footsteps and begin their novitiate year. May God continue to bless the Paulists and the entire Church with men willing to leap into the dark and commit their lives to ministry as priests in the Church! From June 2009 through June 2010, the Church observed a special "Year for Pirests," intended to deepen priests' commitment for the sake of a more forceful and effective witness to the Gospel in today's world. The year began in Rome with the Pope venerating the relic of the heart of St. John Vianney, the patron saint of parish priests, who died 151 years ago tomorrow. That same year, Charles Dickens published A Tale of Two Cities, a novel aobut the French Revoltuon, which begins with the famous phrase, "It was the best of times, it was the worst of times." Into that turbulent "worst of times," John Vianney was born just three years before the Revolution - a movement inspired by a hatred for the Church, the likes of which Europe had not seen since the worst of the Roman Emperors. Churches were desecrated and destroyed; and bishops, priests, and religious were massacred. Young John Vianney received his First Communion in secret, since public celebration of Mass by priests loyal to the Church was illegal. After the Emperor Napoleon had restored some semblance of peace between Church and State, 20-year old John Vianney went to school to study for the priesthood. He failed the seminary admission test, but somehow managed on his second try. Even then, he was such a poor student that his continuance was in question. The Vicar General of the diocese finally asked the seminary rector, "Is Monsieur Vianney good?" The rector replied, "He is a model of goodness." To that, the Vicar General then replied: "Let him be ordained. The grace of God will do the rest." Commenting later on John Vianney's difficulties as a student, Isaac Hecker believed he recongized "the supernatural action of the Holy Spirit at work" in John Vianney's difficulties. The damage done by the revolutionary "worst of times" was eminently evident in the little village of Ars (population 230), to which Fr. Vianney was sent as pastor in 1817. His bishop warned him, "There is little love of God in that parish." Eventually, however, in Ars, "the worst of times" became "the best of times" - thanks to John Vianney's complete identification with his priestly vocation. Always aware of his own inadequacies, but obedient to the Church that had called him to be a pastor and devoted to the people committed to his care, he sought to harmonize his own life with the holiness he was called to embody as a priest, instructing his parishioners by the personal witness of his life. "There are no two ways of serving God," he explained. "There is only one: serve him as he desires to be served." Those who watched him celebrate Mass said "it was not possible to find a finer example of worship." John Vianney was said to have "gazed upon the Host with immense love." He believed the fervor of a priest depended on the Mass. "My God," he famously said, "how we ought to pity a priest who celebrates as if he were engaged in something routine." By his example, he helped his parishioners to pray. "One need not say much to pray well," he told them. 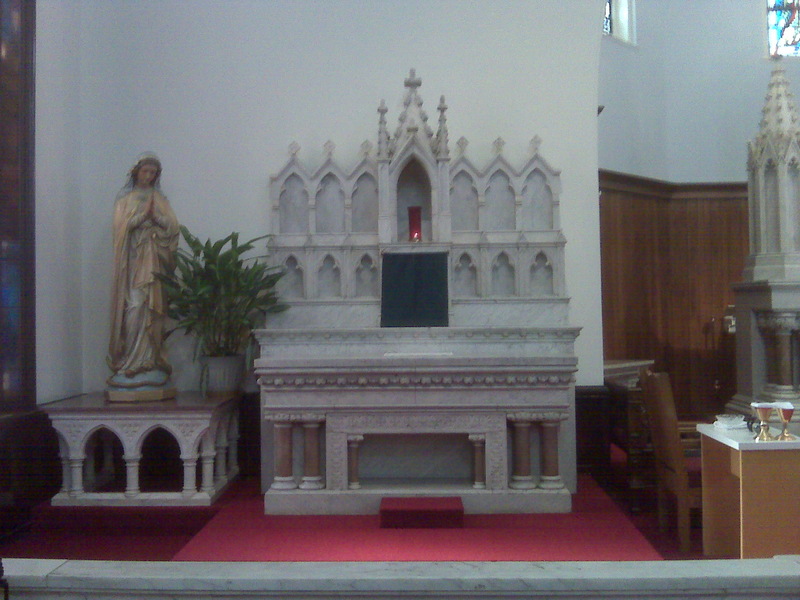 "We know that Jesus is there in the tabernacle: let us open our hearts to him, let us rejoice in his sacred presence. that is the best prayer." St. John Vianney is perhaps most famous for his ministry in the confessional. One legacy of "the worst of times" upheaval produced by the Rvolution was widespread indifference to the sacrament of forgiveness. Eventually, however, penitents would be coming to him from all over France, finally making it one of "the best of times" for the great sacrament of God's mercy. Earlier this morning, we (that is, the Knoxville Paulists) stood on the porch of our house and waved goodbye to my predecessor as pastor of Immaculate Conception Church, as he headed north with all his worldly goods to assume the ministry of Paulist Director of the Newman Center in Columbus, Ohio. A few minutes later, with a lot less fanfare, I packed up some things and got into the car that as of today has become mine and drove the short distance to the church that I am now pastor of. Now I am sitting in my office, surrounded by the chaos of boxes and possessions that are waiting to be organized, wondering just what I should be doing first. The one thing I know I will be doing today for certain is to celebrate the daily Mass in the church at 12:10. According to Canon Law, "priests are earnestly invited to offer the euchristic sacrifice daily" (Canon 276.2). While obviously not a strict obligation, this recommendation reflects the accumulated wisdom of recent centuries, when the celebration of daily Mass became an increasingly important part of popular as well as priestly piety. (One of the already evident consequences of the shortage of priests is the severely diminished access to daily Mass in many places, not to mention the even more tragic situation of diminished access to Sunday Mass in many places). Generally speaking (with obvious exceptions), daily (or almost daily) Mass has been more or less the rule for me in my two previous assignments as a priest (Toronto and New York). Although there is only one scheduled daily Mass Monday-Saturday here, various other obligations will likely make daily (or almost daily) Mass more the rule than the exception here too. And that seems good. Apart from all the theological and spiritual considerations that have animated the modern traditon of daily Mass, I think it works well, at least for me, as a sort of stabilizing spiritual anchor in one's regular routine, with all its confusions and distractions. And at no time is that more obvious, perhaps, than when one is in transition, as I am! So I look forward to centering these confusing, awkward, and demanding transitional days around the daily celebration of the Mass with the gathered community of my parishioners in our beautiful parish church.